Did Chrysler offer a black body paint color in 1960 on the Windsor? Was it called Executive Gray or a different name? 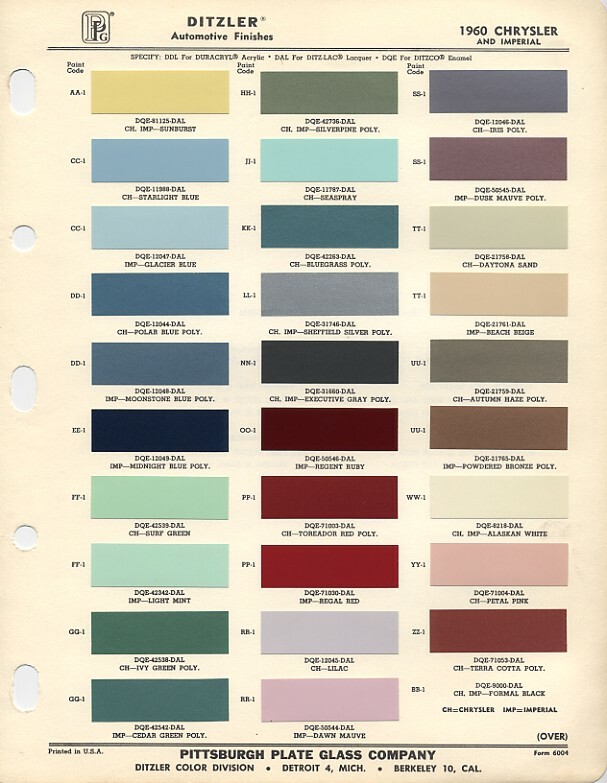 Here's a color chip chart for 1960 Chrysler. I'm not sure why black is not shown, as it certainly was available on them. Location: Southern Sweden - Sturkö island The correct color name was "Formal Black" with the color code BB1 (all black, body and roof), used on both Chrysler and Imperial cars. Location: Under the X in Texas Black is never shown on color chip sheets. There would be no point to doing so ! Location: DFW, TX Totally true. Many colors have various hues and brightness levels. Whites... there are thousands of different "white" paint codes. Go to your home improvement store to see the ranges! But unlike other colors, black is black. If there are toners or metallics or pearls in a "black" color, then it is not truly black. Famously, GM had a "black" they used during the '80s that was really a very dark reddish brown color - not black.